Ticket sales have not been enabled yet, please check back soon. 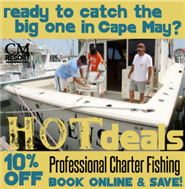 Experience a Professional Fishing Charter Aboard the vessel " Common Sense" in Cape May NJ. Experience fishing in Cape May with a professional USCG approved fishing Captain Clement aboard the 36 foot Hatteras " Common Sense" moored at the South Jersey Marina. Captain Clint Clement offers Inshore Fishing Trips, Off Shore Trips and also provides special services for Sunset Cruises, Memorials and Sightseeing Trips. Spend a day Off Shore Deep Sea Fishing or fish the back bays for a half day trip. You can also make reservations for special cruises including Sunset Trips, Memorials and Sighting Seeing Trips. All Cape May Fishing Charters booked require a 50% deposit on line with Cape May Resort.. You can book our reservation here by simply clicking on the link and selecting the package that your would like to order. Please note that cancellations due to bad weather and safety are a the full discretion's of the Captain. In the event of a cancelled trip due to weather the Charter will be re-scheduled. The Vessel " Common Sense" operates with a zero tolerance program, beer during is moderation is permitted with no bottles on board. All prices are subject to change with fuel cost variations. All ticket sales require 50% payment in at time of booking with Cape May Resort.com SimpleTix, the balance is due at departure. Memorial Trips at Sea - The scattering of ashes is a beautiful way for family and friends to say goodbye and celebrate a life lived.